Bosvay® - The Ultimate Blend of Natural Resins - Effective & Powerful. Harvested from a protected area. Checked against heavy metals and pesticides. GMP certified and HPLC quality analysis. High AKBA, AcBA, KBA, β-BA (60+mg per capsule). 100% African Boswellia Carterii & Boswellia Sacra Blend. Natural Vegetable Cellulose Capsules (no gelatin). Taking Bosvay® to support health issues: 2 capsules twice a day is typically sufficient. Taking Bosvay® to support serious health issues: 5 capsules twice a day is recommended. We strongly suggest Bosvay® be taken with a meal containing fat to increase absorption. Bosvay® peaks in the blood stream between 60-120 minutes and stays in the bloodstream for 8 hours. Take a 2 day "Bosvay® Holiday" every month so as not to acclimate to Bosvay®. Up to 10 capsules a day are recommended by Health Professionals. 100% Natural - uses no fillers or artificial materials. The capsule is Organic and all of the ingredients are Natural. Jan S. on 17/May/2018 Really happy I started taking this product, thank you. Wayne M. on 21/Nov/2017 Will comment later; too early to rate this product. David S. on 22/Oct/2017 Very pleased with quality of product. Although it's early days, an ulcerating BCC on my back has already shrunk by a third in 2 weeks. Watching this space. My brain tumor has almost gone after 6 months on Bosvay. I take 10 capsules a day with food and feel great. Brain Tumor Cerebal Edema - 10 x capsules a day significantly reduces cerebal oedema (>75%) in the majority of patients. Glioblastoma and Leukaemia - inhibits proliferation of these tumour cells. Rheumatism - reduces inflammation by inhibiting leukocyte elastase and degrading glycosaminoglycans. Arthritis - significantly suppresses local tissue TNF-α- and IL-1β and reduces oedema. Ulcerative Colitis, IBS, Bronchitis, Sinusitis - inhibits 5-lipoxygenase and prevents the release of leukotrienes, thus having an anti-inflammatory effect on these conditions. Asthma - use reduces the risk of Asthma. Anti-bacterial - Proven against Staphlococcus aureus, Streptococcus pyogenes, E.coli, & Salmonella. Anti-fungal - Proven against Candida albicans, Candida tropicalis, Aspergillus flavus, & 12 food-borne moulds. Anti-inflammatory - Inhibits the production of inflammatory mediators and reduces the production of leukotrienes through its inhibitory action on lipoxygenase. Anti-oxidant - Inhibits CYP (CYP is a large group of enzymes that oxidize organic substances) enzymes. Also has demonstrated a mild cardioprotective effect using a model of myocardial infarction induced by isoprenaline. Immunomodulator - Occurs through macrophage stimulation and modulation of the complement system. 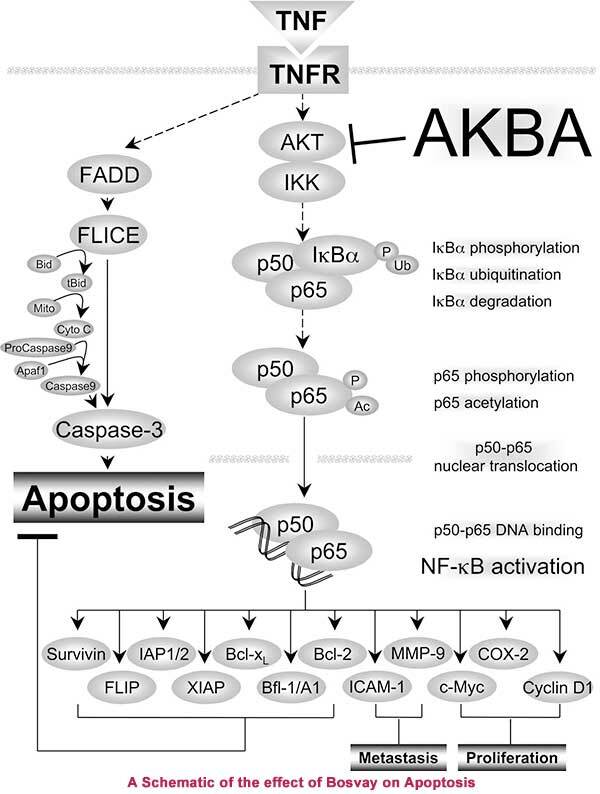 Anti-cancer - Anticarcinogenic, antitumoural, & anti-proliferative effect. Appears to lead to activation of genes responsible for cell cycle arrest, growth inhibition and apoptosis. Anti-arthritic - Decreases arthritic scores (reduces pain and swelling and increases mobility). Gastric Stimulation - Increases appetite and the flow of digestive juices, thus leading to improvements in digestion and absorption. Gas repellent. Boswellia acts on cerebral edema in patients irradiated for brain tumors: a prospective, randomized, placebo-controlled, double-blind pilot trial. Cancer. 2011 Aug 15;117(16):3788-95. doi: 10.1002/cncr.25945. Epub 2011 Feb 1. Kirste S, Treier M, Wehrle SJ, Becker G, Abdel-Tawab M, Gerbeth K, Hug MJ, Lubrich B, Grosu AL, Momm F.